The Contigo Round Cubic Zirconia Pave Halo Solitaire Engagement Ring has a 2 carat 8mm round cubic zirconia center stone beautifully set with split prongs. 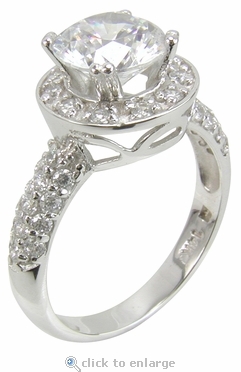 A halo of pave set round cubic zirconia stones encircle the center stone and halfway down both sides of the shank. 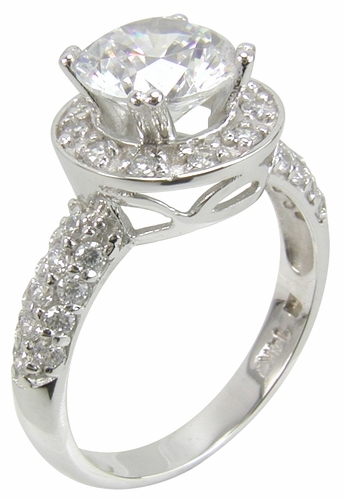 Our cubic zirconia stones are all hand cut and hand polished to exact diamond specifications. 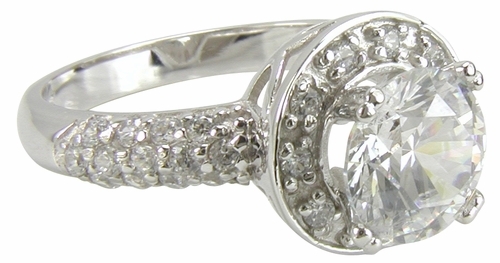 This halo engagement ring includes 2.75 carats in total carat weight with a lifetime warranty against cracking, chipping, fading or losing brilliance. Due to extremely low pricing, all clearance sales are final. Clearance items are stocked in a certain finger size(s), see below. They may be sized for an additional fee, see the Sizing options window below. Sizes below a 5 or above an 8 can be made via Special Order, Call 1-866-ZIAMOND for a quote or you may also speak with a knowledgeable representative via live chat.